UPVC Doors are high quality Vacuum Formed 100% uPvc Doors. Manufactured by compressing two PVCu skins either side of an Extra High Density Natural core at pressures three and half tonnes per square metre. Creating a solid door panel that is resists both heat and moisture and retains a high colour stability. All door panels are backed by a 10 year manufacturers warranty. Door panels come in a selection of styles and finishes, from white to woodgrain and half glazed to completely solid panels. Like it? Make sure you use the buttons on the left to share or send the page to your own or somebody else's address so you can come back esily. Multiple Colour Combinations, Please note, Internal frame & Door colour is white as standard, it is possible to have a rosewood or light oak internal frame but it must match external colour. Extras are available at extra cost such as spyholes, Knockers, Numbers and frame extenders, please call 01482 352 932 for more information. Trojan Door hinges are fitted as standard. These are available in White, Brown & Tan. Full 3D adjustment is available with this hinge with simultaneous vertical adjustment across all hinges which ensures even load distribution. Lateral adjustment is done in a single operation which gives a perfect alignment on the pivot axis. The hinge fits into the rebate to give an unobtrusive secure design. 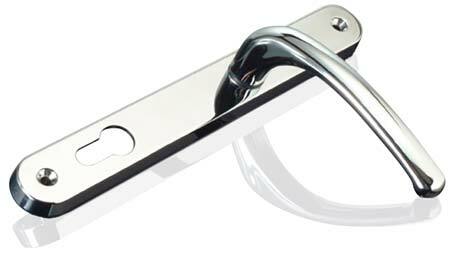 The hinge will achieve PAS23/24 accreditation. The slab can easily be removed from the frame for easy installation. The first thing you want from a door is to keep the bad guys out. Rather than rely upon badges and star accreditation's influenced by lock manufacturers and carried out in test centres these films show you a real life door, on a real life home, with an increasingly real life entry method. They show how weak your doors are in real life. 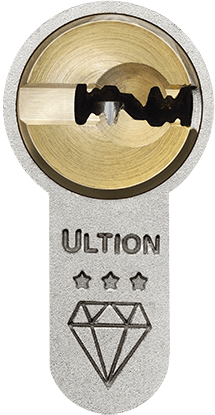 Some locks have 5 pins, others have 6, Ultion has 11. The moment that Ultion detects forced entry it activates an attack lock directly into the central cam, this is 'Lockdown Mode'. Even if the most determined intruder gets past Ultion's two sacrificial sections he won't get to the attack lock because it is protected deep inside a solid molybdenum core and secured with a dedicated retaining pin. When Ultion is in Lockdown Mode your home and family are safe. Its something we all do, we lock the door and leave the key in the lock on the inside. Even with the most snap secure locks leaving the key in the lock can completely remove any snap protection you thought you had. The unique and patented glazing cassette can be removed from the inside to let you simply change the glass and reuse the cassette. You won’t need a new door because it has been damaged whilst trying to follow impossible deglazing knacks and techniques! Part M Compliant Aluminium thresholds are available in Hardex Chrome and Hardex Gold finish to match the hardware. All doors are fitted with Fab & Fix furniture as standard. The Fab & Fix ‘Hardex’ finish is extremely resilient. The electro colour finishes are applied to every part of the elegant and conventionally styled furniture range. Colours available are White, Hardex Chrome, Hardex Gold, Satin Chrome & Black. Stylish Urn Knockers and Numerals are available to enhance the doors looks. All production processes comply fully with the quality assurance standard BS EN ISO 9001. You can expect delivery between 2 - 3 Weeks from date of Confirmation. These guidelines are to help you measure for a new PVC front and frame and make an accurate measurement. Measure the door opening outside on both the height and width. You have to always measure the exact brickwork opening and not the old frame or door. Measure brick to brick in at least three different places and then deduct 10mm from both the final height and width measurements. - This is to allow for the for 5mm fitting allowance around the new frame. This will make sure the new frame will sit plumb and square once in place. If you have any gaps then spacers and filler will be required to secure the frame into place and fill any of the gaps. Do not measure your existing door or frame but measure the brick opening. Make sure to measure in at least three different places and deduct 10mm from both the final height and width measurements - we do not make any fitting allowances on the sizes you provide. All dimensions to be supplied in Metric and all designs viewed externally. The width should be measured brick to brick at three points - top, middle and bottom of the opening. The smallest of these measurements is taken as the width. Always deduct 10mm from the final width. The height should be measured brick to brick at three points - left, middle and right of the opening. The smallest of these measurements is taken as the height. Always deduct 10mm from the final height.